Not to paint a misleading picture of C. He does eat meat…and enjoys it. He is by no means a vegetarian by any stretch of the imagination. And he is just as likely to say, “We haven’t had steak in a while”, as he is to say, “We haven’t had pechay in a while.” He is more an alpha-jock than he is a sensitive-poet. But he does love his veggies…he even loves this one! That being said, as with all aspects of life, there are times when, even forearmed with important knowledge, you can still strike out. As I did with these roasted carrots. I tell you – they were fabulous! Not just any roasted carrots, but honey roasted carrots with fennel. Not just any carrots, but pretty, svelte ones that came crowned with a gorgeous mane of green, from my favorite organic farmer (like these carrots). Not just any honey, but honey from a local bee farm in Tagaytay, brought back for me by my dear friend N. Not just any fennel, but locally-grown fennel which I spotted in the stall of another organic farmer in the market. So you see, pretty special stuff! I tossed the fennel and carrots with the honey and some olive oil and in the oven they went to slowly roast and caramelize. Roasting is one of my favorite things to do with sturdy vegetables such as carrots — the slow heat concentrating the sugars until you are left with a soft, yielding piece of veg with all its natural sugars singing in tandem! And for a vegetable like fennel, which I don’t particularly like raw, it tames the sharp anise-flavor, aside from heightening the sweetness. The honey just brings everything to a crescendo…the perfect siding for roast meats, or just to snack on indiscriminately as you would carrot sticks. Knowing this, you can imagine that I was just a wee bit proud of myself as I trotted this out to C come dinner time. He looked at the pan, and then at me, and said, “Carrots are not really my favorite vegetable…” What??? (Yes, there are still many surprises in marriage) He likes this but not my honey-roasted carrots??? – Trim stalks off the carrots and peel. If you have bigger carrots, slice lengthways into sticks. Trim and cut the fennel into quarters or eighths (depending on size). 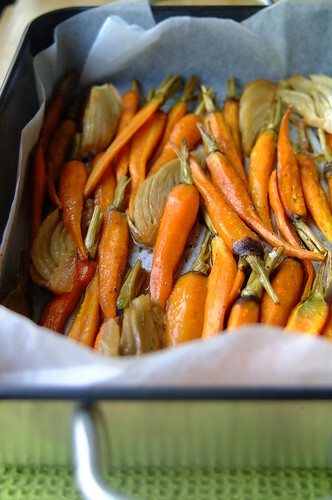 – Line a roasting tin with baking paper, lay carrots and fennel flat in the tin, and drizzle with the honey and olive oil. Sprinkle with salt and pepper. Toss to coat. – Place in a 180-190C oven and roast for about 35-45 minutes or until carrots are tender.